Give your heating system a service before it bites back! We all service our car’s regularly or it breaks down! We have a health check and virus updates on our computer to ensure it works correctly! 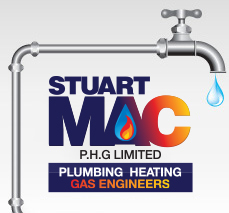 We have our boilers and fires serviced to ensure that they are working correctly? BUT not many people have their heating system serviced, having your boiler serviced does not give your heating system the green light! Consequently our heating system works harder to keep us warm, system pumps are overworked eventually it all breaks usually when you need it most!! Even if you have had a central heating system for a number of years, and you need to replace your boiler, you may not need to replace all or indeed any of your radiators. However, in order to comply with part L of building regulations, when installing a new boiler into an old system, it is now essential that a ‘power flush’ is carried out on your radiators and pipe work. This power flush, or ‘jet flush’ as it is sometimes known, involves pushing a high pressure jet of water through your central heating system. The result is that it clears out the buildup of lime scale and grime that can accumulate out of sight on the inside of your radiators. This will increase the heat that you receive from your radiators without the cost or mess of replacing them. What causes knocking noises in boilers? 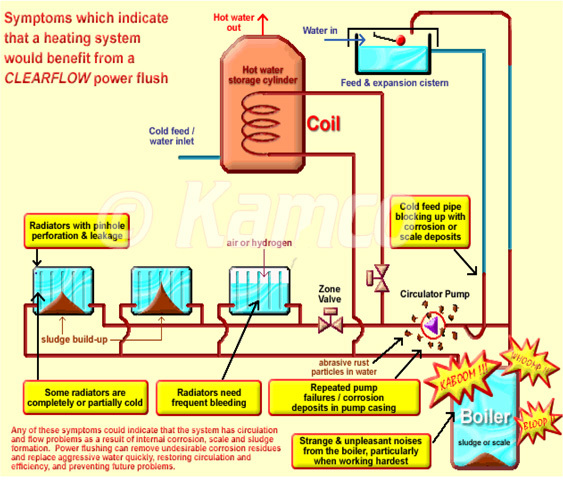 Boiler noises result from localised boiling of the water. This happens when the inside surface of the boiler becomes too hot due to scale or baked on sludge deposits. All systems over about five years can suffer noise and new boilers in old systems are especially vulnerable. Either clean the boiler and system or wait a while and it will need replacing. .
Do you provide anything to get rid of air? Air collecting in radiators can be formed either by a system fault that causes air to be sucked into the system, or by corrosion that generates not air, but hydrogen gas. Suction air is a design fault that must be remedied by improving the system layout and cannot be resolved by treatment. Hydrogen gas problems can be easily corrected by cleaning with specialist products..